The biggest element to successfully owning a Beagle is to allow it to run and play daily. If you can keep up with their energy level, then they are relatively easy companions otherwise. They are adaptable living in or outdoors with ease and you will need to set up their training schedule young as they can be stubborn to train the older they get. Friendly and very social dogs with a personality to bond with strangers and children easily makes the Beagle one of the most common family canines. Grooming a Beagle is very low maintenance with a limited need for brushing and nail clipping. One common health concern for a Beagle is their ability to suffer from an intervertebral disk disease. CHD, or a canine hip issue is also common, but does occur as the hound ages. Some minor issues that can also develop in Beagles are cherry eye, glaucoma, KCS which is a form of dry eye disease and an overactive thyroid. On rare occurrences, the Beagle can suffer from cataracts, losing their hearing, umbilical hernia and hemophilia as well. Vet recommended routine testing for Beagles may be for their hips, eyesight and the thyroid gland. Generally speaking, the Beagle can live an average lifespan of twelve to fifteen years long. Weighing around twenty to thirty pounds, the Beagle makes a great fit for a house pet. 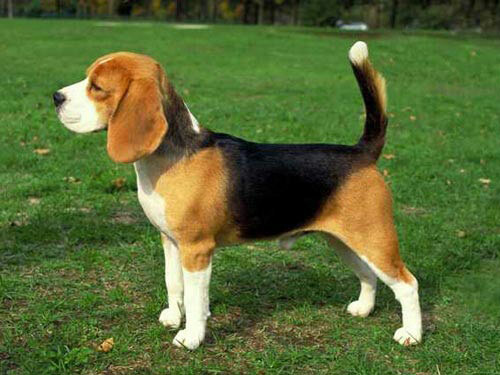 The Beagle is one of the breeds that dates all the way back to the 1300’s. They quickly became adored for their ability to hunt rabbits in England and Scotland. The actual name Beagle is derived from a French definition of “open throat” or from the Celtic and English reference to them being small canines. Great for detecting contraband, the Beagles were a favorite among hunters in the 1400’s for their compact size to be taken along on hunting adventures with ease. Measuring a mere nine to thirteen inches in height, they could be carried if need be while out in field all day long with their owners. In the 1600’s, they made their way to the United States, but they were not as popular as the other breeds that were common from the United Kingdom. They have grown to become a family favorite pet and do quite well in competitions as well.